Why not have your ceremony aboard a yacht. A really exciting and wonderful option for those looking for something a little different. Celebrate whilst cruising over the clear waters of the Mediterranean sea to the backdrop of a stunning sunset. Imagine a balloon filled yacht, ribbon and flower decorated tables for your magical day. Whether having a ceremony on board in a local church or town hall, you can continue with a wedding reception onboard. Sailing away on a yacht takes really does takes some beating! 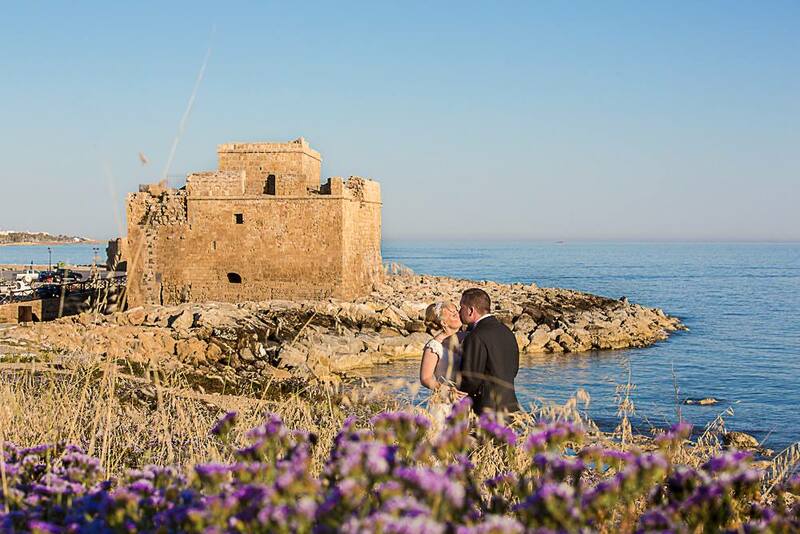 Board your yacht at the harbor with the beautiful Paphos medieval castle in the back-ground. We can offer a selection of private yachts to suit the size of your wedding party and budget. There are a number of packages available from 2hrs up to 6hr yacht hire. You may decide to have a finger buffet, buffet meal or sit down meal plus open bar or pay as you go. For those wishing to make use of a 4hr, 5hr or 6hr package we can arrange your very own private DJ on board that will add to the atmosphere and get everyone in the mood for your afternoon or evening celebration. Please enquire for further details should you prefer this alternative Amazing Yacht Wedding and Reception option. Supplements are applicable on the “Sea Star” yacht if required before 17.00hrs. €1,100 depending on package chosen. Supplement for Ocean Flyer yacht of €1,700. This price includes an overnight stay in the Honeymoon Suite, Moet & Chandon champagne, continental breakfast, scheduled cruise the following Morning and a chauffeur driven car to take you back to your accommodation. All prices include: Yacht, Captain, Crew, Fuel, Port Taxes and VAT, Wedding Ribbons, Rosettes, Balloons and Table Decorations- the table decoration included is the silk flower arrangements only. Glass Decorations Bows and flowers can be arranged at an additional cost. Please note to be included in the cost, should you wish to marry onboard is the ceremony, license & registrar fee payable to the town hall. €633. It is also very important to be aware that should you choose the ocean flyer yacht there is a supplement of €1,700.00 payable regardless of the time you wish to hire the yacht, should you prefer the sea star yacht there is no supplement required as with the korisivo yacht but the yachts will be available from only 5pm. Why not treat your guests to a very special THANK YOU party! Or even a pre-wedding get together so your families and meet and mingle before the big day. You DO NOT need to have had your wedding on board, but, we would like to offer you a very special day or evening out altogether before everyone goes home. What better way to thank your family and friends for coming over to Cyprus with you to celebrate your wedding? We start by collecting you and your guests from their accommodation with our Bridal Bus (open topped London Bus) and having a tour of Paphos and then heading down to the harbor to board one of the yachts for a two hour cruise, complete with champagne, open bar and fruits, returning back to the harbor for a return journey to your accommodation with our open top bus.  Champagne, drinks and fruits on the yacht included. Please note that these parties will be on board Jolly Roger or Kurosivo IV. However, the Company has the right to change to another vessel if required. There may be other wedding parties on board at the same time.